My philosophy is that everyone is creative and it is only as we grow to adulthood that inhibitions block much of our creativity. I firmly believe that creativity frees productivity (one of my favorite sayings). I help people tap their creativity and drive productivity through various forms. One is humor. I use this tactic in my workshops with clients. Another tactic is the written word. Words are magic. They have tremendous power. I teach people how to use words effectively to communicate. I'm a writer, artist and designer and used to be an actress. I've been teaching creativity workshops for more than twenty-five years. I organized a successful writers' weekend seminar for the American Book Center in Amsterdam and was managing director of writing activities for their ABC Treehouse. I now independently teach writing, art and creativity workshops and lead critique and writers' groups. I’m a former editor of www.flashquake.org. As a designer, I am internationally renowned for my toy designs, have designed for major manufacturers, and was once a guest artist at Disney World. My designs have been featured in various museums around the world. Originally from the US, I’ve spent more than 30 years in Amsterdam. I write fiction and nonfiction (the nonfiction pays many of my bills). 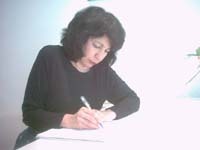 I write web content and business brochures and do editing, proofreading and translating (Dutch to English). More than 250 of my articles have been published, mainly in print, but some have been in electronic markets. Subjects have been travel, how-to (crafts), art, book reviews, motivational (business and personal). Flash fiction is my favorite way of writing and anything that falls under the wide umbrella of mystery appeals to me, as does humor. I've written for the Time Out Guide to Amsterdam, International Herald Tribune, Weissmann Travel Reports, many major craft publications in the US and Europe, BABY art and design magazine, Expats Magazine, Expatica.com, and many others. Recent projects include significant contributions to Fodor's Amsterdam, Fodor's Europe and Fodor's Holland. My flash fiction stories have appeared in Amoret, FUTURES, Nefarious, Flashquake, Furious Pen, Mindprints, Flash Fantastic, Flashshot, 31 Eyes, Hiss Quarterly and other publications. I’ve won awards in numerous writing competitions. Several flash stories and a poem have been accepted for BULLET POINTS, an upcoming mystery anthology.